When we started offering pure, all-natural coconut milk for the first time a few years ago, it was an instant success. 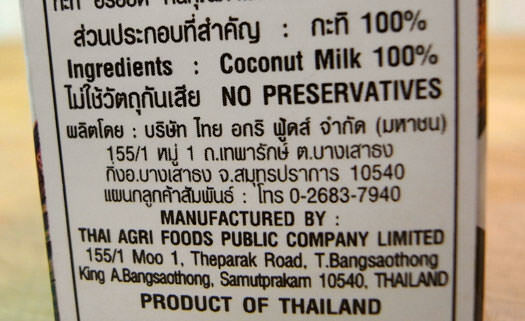 Until then, it was only possible to buy canned coconut milk that contained preservatives and had a 3 year shelf life. Only the very best quality coconut can be packed this way, in a modern paper carton (BPA free, made by SGI Combibloc of Switzerland or Tetrapak of Sweden). We offer both Aroy-D and Chaokoh brands, and different fat content for each brand. Aroy-D is completely preservative free, fresh stock, one year shelf life. As of September 2017 Chaokoh is now adding polysorbate and xanthan gum to the coconut milk. Aroy-D is a large company manufacturing a wide variety of products. They produced a national advertising campaign promoting their status as the number one choice of chefs. Chaokoh is another large company with a main focus on coconut milk, probably the largest source of coconut milk in the world, the brand most often found in restaurants. They are both capable of producing excellent all-natural quality but some customers like one brand over the other. We tend to think the freshest will be best, and we are proud to mention here dates for each brand. There are two sizes available. A nice large box 33.8 oz (a bit more than 1 quart). We also offer it in a small and convenient 8.5 oz box (slightly more than 1 cup). Coconut milk is watered down with each stage of "squeezing" (see our video: how coconut milk is made). The richest liquid comes first, has higher fat content, and is generally preferred for making the best tasting Thai curry and soups, but also more expensive. Coconut fat is consider a healthy, good fat and we recommend using higher fat milks for best results. There is no difference between "milk" and "cream", only the fat content -- the two look identical. In our video we compare them. Ingredients, Chaokoh: Coconut Extract, Water, Polysorbate (as emulsifier), Xanthan Gum (as stabilizer). Aroy-D is nothing but pure 100% coconut milk. Chaokoh has added two ingredients in order to prevent separation. 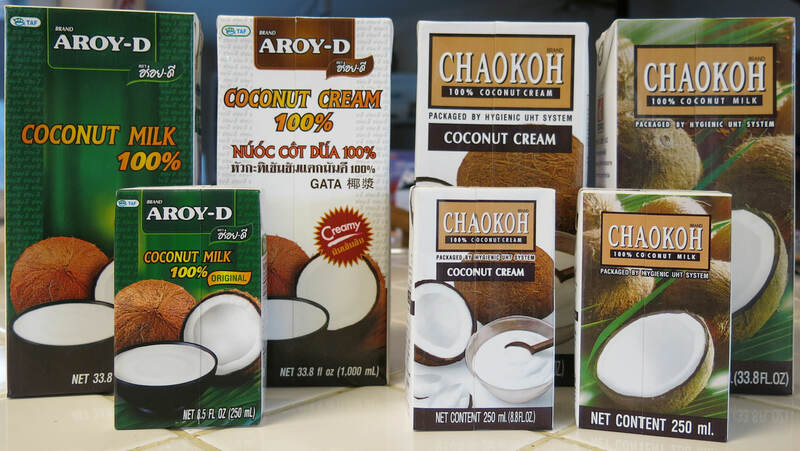 Add to Cart 6 boxes (small) 8.5 oz - Aroy-D All Natural Coconut Milk - $12.89 - February 2020 Expiry Date. Add to Cart 12 boxes (small) 8.5 oz - Aroy-D All Natural Coconut Milk - $19.89 - February 2020 Expiry Date. Add to Cart 12 boxes (small) 8.5 oz - Aroy-D All Natural Coconut Cream (NEW) - $19.89 - December 2019 Expiry Date. Add to Cart 12 boxes (small) 8.5 oz - Chaokoh CLASSIC GOLD Cream - $19.89 - February 2020 Expiry Date. Add to Cart 1 box (large) 33.8 oz - CHAOKOH CLASSIC GOLD Cream - $6.89 - February 2020 Expiry Date. Add to Cart 12 boxes (large) 33.8 oz - CHAOKOH CLASSIC GOLD Cream - $67.50 - February 2020 Expiry Date. Add to Cart 1 box (large) 33.8 oz - Aroy-D Natural Coconut Milk - $6.89 - November 2019 Expiry Date. Add to Cart 12 boxes (large) 33.8 oz - Aroy-D Natural Coconut Milk $63.50 - NEW BOX- November 2019 Expiry Date. Add to Cart 1 box (large) 33.8 oz - Aroy-D Natural Coconut Cream - $6.89 - December 2019 Expiry Date. Add to Cart 12 boxes (large) 33.8 oz - Aroy-D Natural Coconut Cream - $67.50 - December 2019 Expiry Date. "We order AROY-D coconut milk from you. We are nutruition and health conscious, and have experimented with many other "milks", such as soy, hemp, dairy, almond, rice, etc. So far coconut milk seems to be the safest, more nutritious, and - just as important - the tastiest. Did you know that AROY-D is the only coconut milk producer that packages their product in a package instead of a can. Why is this important? Because scientific research has now found that the lining of tin cans contains Bisphenol A (BPA), just like some plastics do. BPA has now been proven to be a carcinogen. It's one of the reasons why people are being encouraged to find alternatives to drinking water from plastic water bottles." Is Aroy-D or Chaokoh All Natural Coconut Milk ORGANIC? First of all, you will never find coconuts on any list of fruits that contain high levels of pesticides. Strawberries, apples and peaches are examples of fruits ranked with high pesticide levels, making organic a wise choice. Coconut milk, on the other hand, is made from mature coconuts (at least one year old), and there is a very thick husk protecting the fruit. These coconuts are grown in trees 20'+ tall. Neither organic nor conventional coconuts have measurable chemical residues in the pulp, so both are good choices. 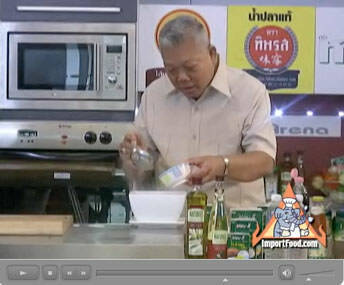 A few years ago we met with Prime Minister of Thailand, Samak, also a celebrity chef who had his own cooking show. He used this coconut milk to make delicious Tom Kha Salmon soup, see our video of Samak's Tom Kha Salmon. Thai Yellow Curry Chicken, "Gaeng Karee Gai"
Green Chicken Curry, "Gaeng Khiao Wan Gai"
Tapioca Pearl and Cantaloupe with Fragrant Coconut Cream, "Sa Koo Cantaloupe"
Thai sweet sticky rice with mango, "Khao Neeo Mamuang"
Northern Style Beef Curry, "Gaeng Hanglay"
Thai Sticky Rice Steeped in Coconut Milk, "Khao Neeo Moon"
Thai Bananas in Sticky Rice, "Khao Tom Madt"
Thai Candied Bananas, "Kluay Cheuam"
Thai Rice Balls in Warm Coconut Milk, "Bua Loi"
Mock Bean Pods with Shrimp Filling and Sweet Filling, "Khanom Thua Paep"
Thai Fried Bananas, "Kluay Tod"
Crystal Sticky Rice, "Khao Neow Keaw"
Vegetable Curry (Indonesian), "Sayur Lodeh"
Thai Green Curry Salmon and Wild Rice"
Volcano Chicken, "Gai Pu Kao"
Thai Black Sticky Rice & Sweet Coconut Milk, "Khao Neeo Dahm"
Coconut Cream -- Fragrant, Rich, Healthy Smoothies. Opening a box of all natural coconut cream is like cracking open a fresh coconut. Wonderful fragrance. Milk is separated from thicker clumps of pure cream with visible pure coconut oil. Cook with it, and an experienced diner will think you're making curry with fresh-squeezed coconut. We love blending together 1/2 of a 33 oz box with fresh organic kale, fresh organic spinach, a whole peeled lemon, two organic bananas, and a cup full of frozen blueberries. You can also add an apple and/or fresh frozen strawberries. 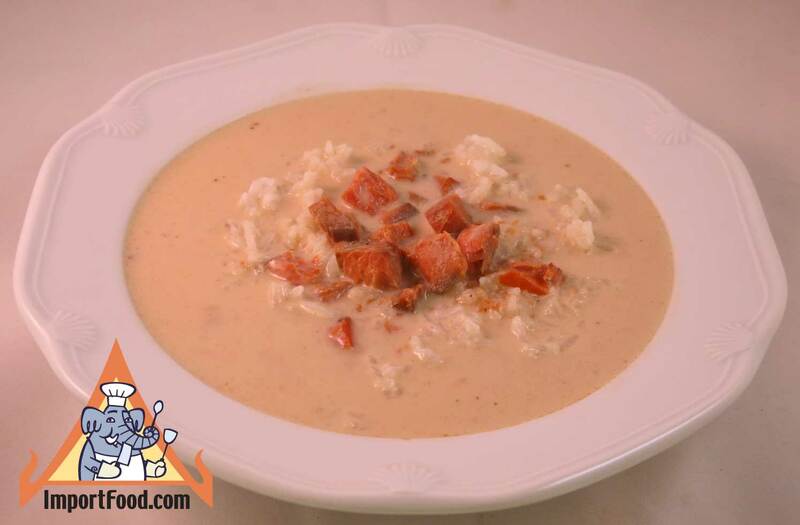 Rich, pure, fragrant coconut milk as the lead ingredient gives it a wonderful flavor. Together, this healthy smoothie packs enough calories to carry you through the morning feeling great. Start by peeling the lemon and tossing it into the blender with coconut cream. 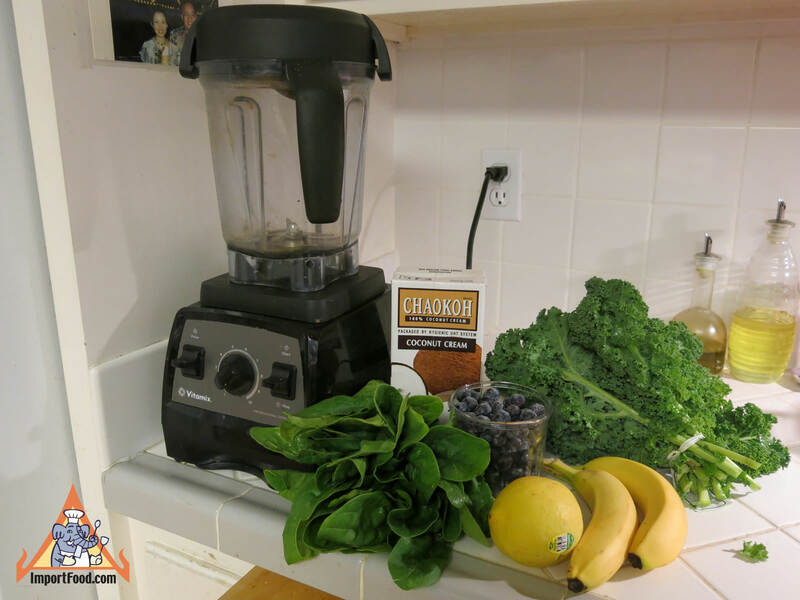 Blend together thoroughly at low speed, then add kale & spinach, and blend at medium speed. Add bananas and frozen berries & blend at high speed until smooth. Enjoy! 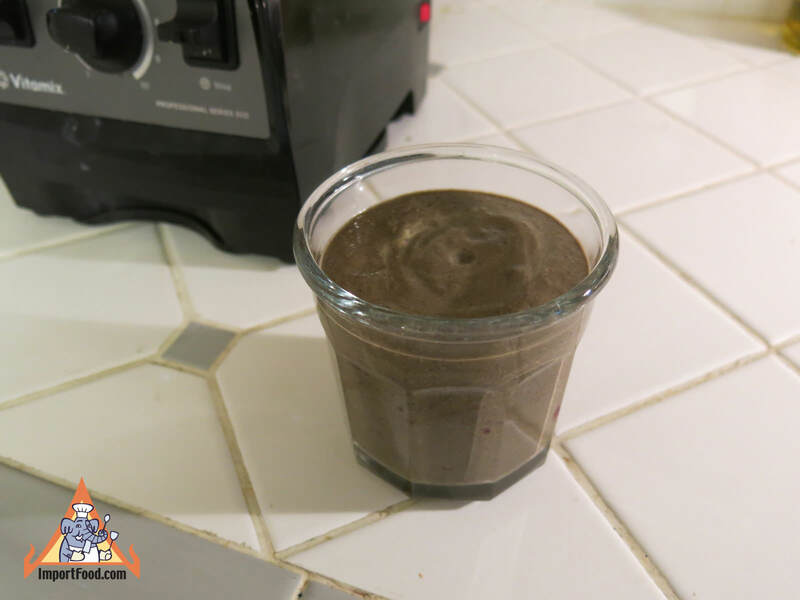 We believe this smoothie to offer such a healthy blend of ingredients that you'll notice improved complexion and overall health. This is a simple and authentic Thai recipe that we enjoy preparing with chicken and just a bit of fresh seasonal greens (in this recipe we used green beans). 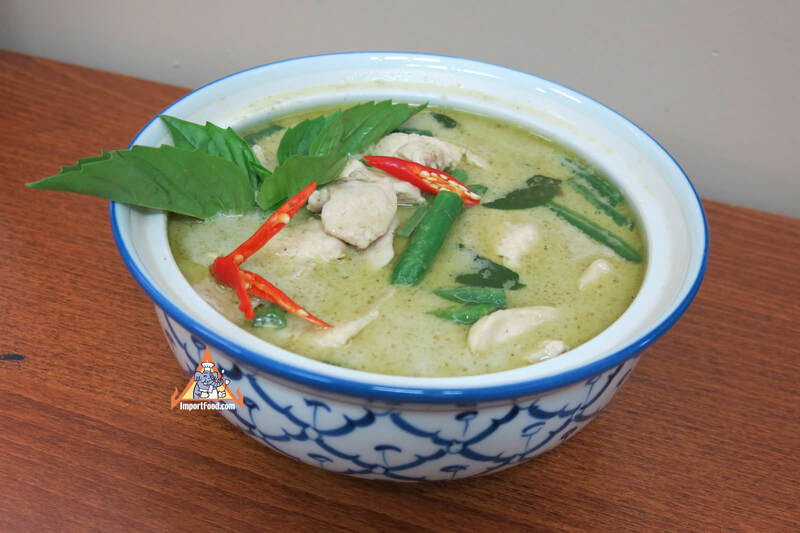 Our basic recipe a delicious green curry with nice flavors that a Thai purist would enjoy. The dish is also made with Thai eggplant or Tiny eggplant. You might also be interested in our similar recipe for a red curry (Gaeng phed gai). We also have a slightly more complicated recipe for Green Curry with Fresh Chile, Chicken, Eggplant & Kaffir Lime, Gaeng Khiao Wan Gai. 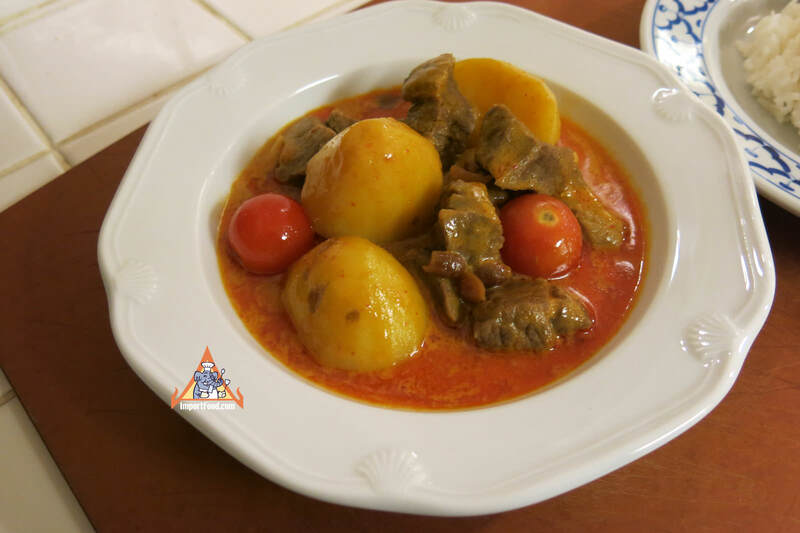 Massaman cooked slowly with tender beef is one of our personal favorites, and many people who call us to order mention that they love massaman beef. Here's a masterpiece recipe that is easy to make and you just can't go wrong. We like to use tri tip steaks, and the small yellow "baby" potatoes. 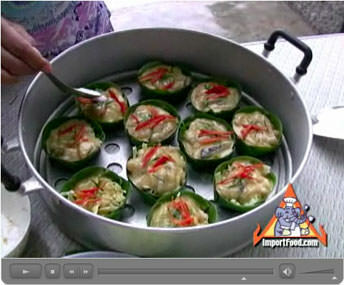 You might also be interested in our instant massaman which is easy to make and tastes very good. NEW: Amazing Elephant brand "Tom Kha" Soup -- It's All In The Pouch. After years of development and investing in America, we are happy to introduce this. Ready-to-eat, premium quality, authentic and delicious Tom Kha soup made in small batches using the highest quality ingredients. Amazing Elephant brand puts everything in the pouch and cooks it to perfection. Even If You Are New to Tom Kha, You Will Love This Soup! 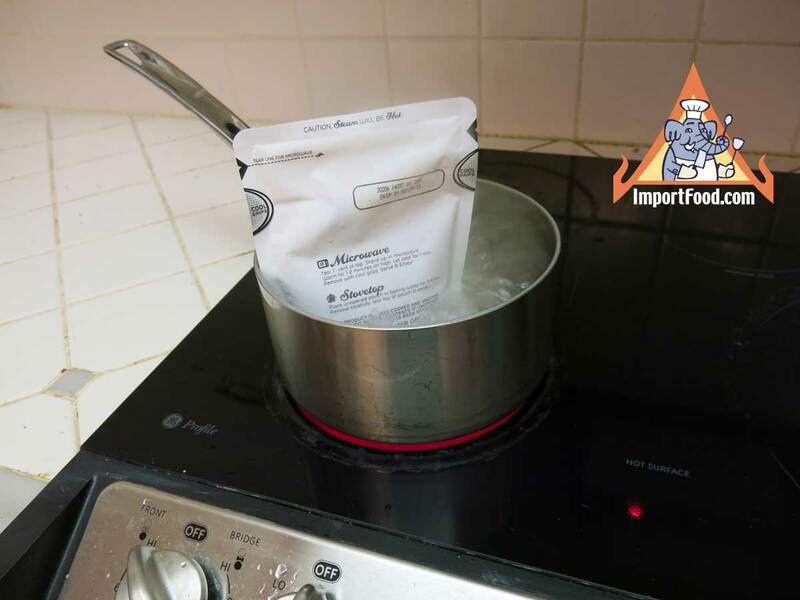 To heat, simply put the pouch in boiling water for 3 minutes then open and serve alone or over rice. You can also microwave it for 90 seconds. It's all inside, so you don't need to add a thing. This all-natural, gluten-free, preservative-free soup is precooked in a modern BPA-free pouch that's shelf stable for two years but tastes like it was just made fresh in a Thai grandmother's kitchen. Premium ingredients and sophisticated preparation ensure that this rivals anything a Thai restaurant serves. 1. 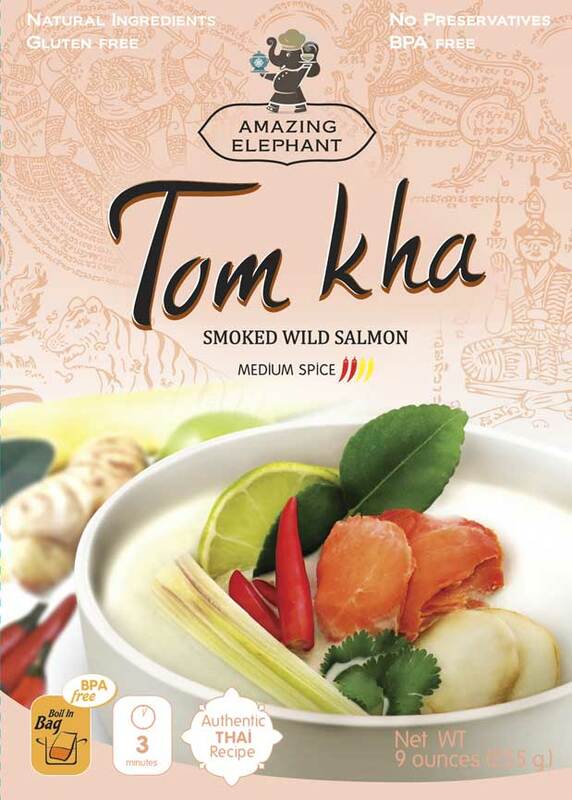 Tom Kha Smoked Salmon: Tom Kha served with smoked Alaskan wild salmon is a combination made in heaven. If you're familiar with Tom Kha chicken, you must try it with smoked salmon. It's "Out of This World" delicious. Each pouch contains a generous 2 oz portion of smoked salmon. 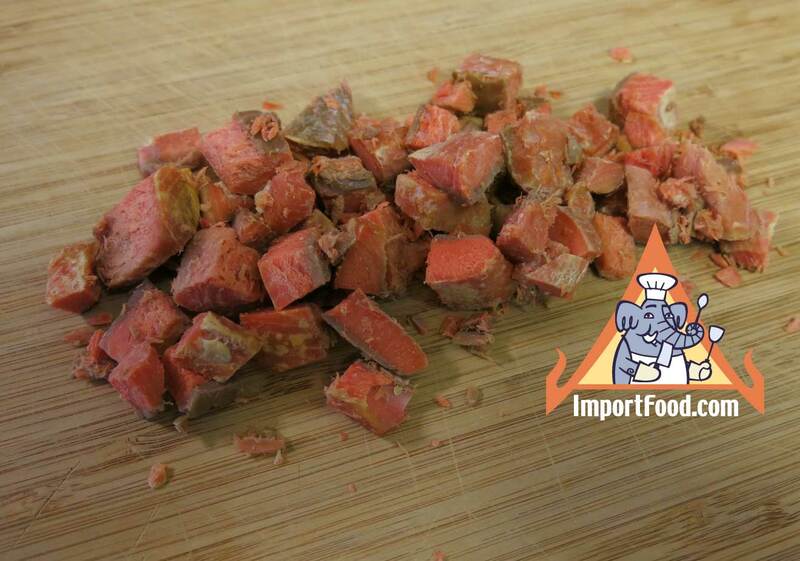 Ingredients: coconut milk, smoked Sockeye or Coho salmon (Sockeye or Coho salmon, salt, natural alder smoke), water, lime juice, fish sauce (anchovies, salt, sugar), cane sugar, galangal, carrots, celery, Thai chili peppers, onions, lemongrass, kaffir lime, shallots, tapioca starch, garlic, dried chiles, kaffir lime leaf powder. 2. Tom Kha (no meat). If you like Tom Kha over rice, or with chicken or shrimp, here's a large (9 oz) serving. Simply heat and serve alone or add meat of your choice. Also very good with fresh mushrooms. Ingredients: coconut milk, water, lime juice, fish sauce (anchovies, salt, sugar), cane sugar, galangal, carrots, celery, Thai chili peppers, onions, lemongrass, Kaffir lime, shallots, tapioca starch, garlic, dried chiles, Kaffir lime leaf powder. The Recipe. For this particular finished product, we're not sharing the recipe (it took years to perfect); but there is no question that it tastes authentic, otherwise we woudn't do it. Our soup rivals anything made from scratch in any famous Thai restaurant (it's *that* good) and simply blows away the existing competition from the likes of Lobo or Por Kwan in their premade Tom Kha instant mixes -- there is no comparison. Once you've tasted this, you may not order Tom Kha at a restaurant again. Here is a good recipe for tom kha if you really do want to make it at home from scratch. For 15 years we've specialized in demonstrating truly authentic Thai recipes, with Tom Kha being one of our website's most popular, for good reason. The combination of coconut milk, galangal, lemongrass, lime juice and chile peppers creates a sensational flavor that somehow transcends taste preferences around the world. Everyone, everywhere, it seems, loves the flavor of Tom Kha. Premium Ingredients, Sophisticated Technology, Artisan "Small Batch" Method. We're passionate about delivering a premium product, and confident that after years of experience dealing with the finest growers and purveyors, nobody can do it better. 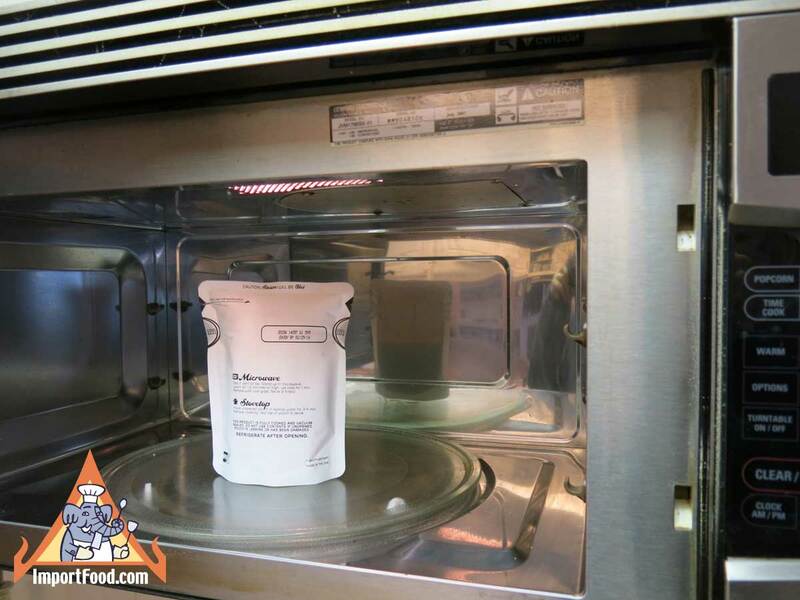 Our process involves preparing relatively small batches. 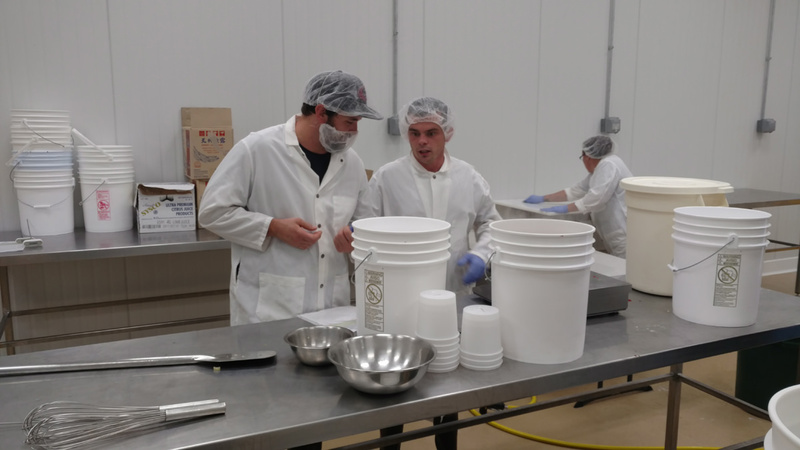 The founder of ImportFood.com literally chooses every fresh ingredient that goes into each batch, and is in the facility personally watching every step of the process. Everything is Fresh -- None of the Ingredients Have Been Frozen. Galangal. The galangal we use is sourced from Hawaii, chosen at the perfect stage to ensure excellent taste and aroma. It comes out of the ground and into our facility within 3 days. We slice the fresh roots by hand just minutes before it goes into the soup. It would be nearly impossible for anyone to make this soup with a fresher galangal. Lime Juice. We carefully select the best fresh limes from a wholesale market in Seattle and squeeze the limes on location. No prepackaged lime juice--just the real thing, fresh-squeezed. This is very time-consuming but we wouldn't have it any other way. One of the highlights of our soup is the rich taste of fresh lime. Chiles and Lemongrass. 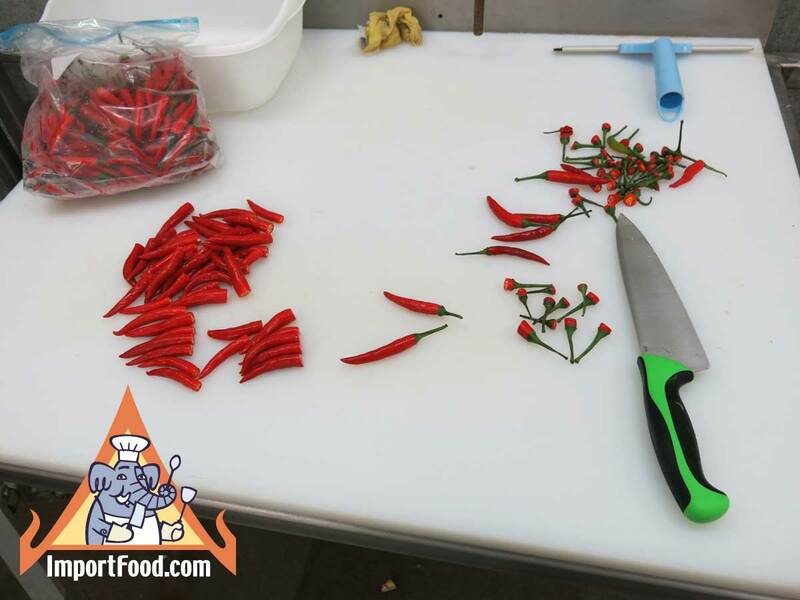 We use the perfect mix of fresh red Thai chiles and lemongrass sourced from the market in Southern California. Every stalk and every chile is selected with our own eyes and cut by hand the same day our soup is made. Garlic and Shallots. We use the highest quality fresh shallots, which come from a small farm in Washington State, and our garlic is a special variety grown in Oregon. Coconut Milk. We use ONLY fresh-pack, all-natural, preservative-free, 100% pure coconut milk. As a direct importer from Thailand for many years, we've established ourselves with what we believe is the best producer of all-natural coconut milk. You are getting the "best of the best" in our soup. Fish Sauce. We use only Tra Chang Gold Label premium fish sauce. Why is it in a Pouch? This is no ordinary pouch--it's the highest quality pouch available anywhere in the world. The pouch is modern, BPA free, simple to use, relatively inexpensive, and far easier on the environment than cans. Our soup is cooked entirely in the pouch in a modern facility using high heat and a relatively long cooking time, under high pressure. The final result is not just a superb product, but one that is shelf-stable for two years. 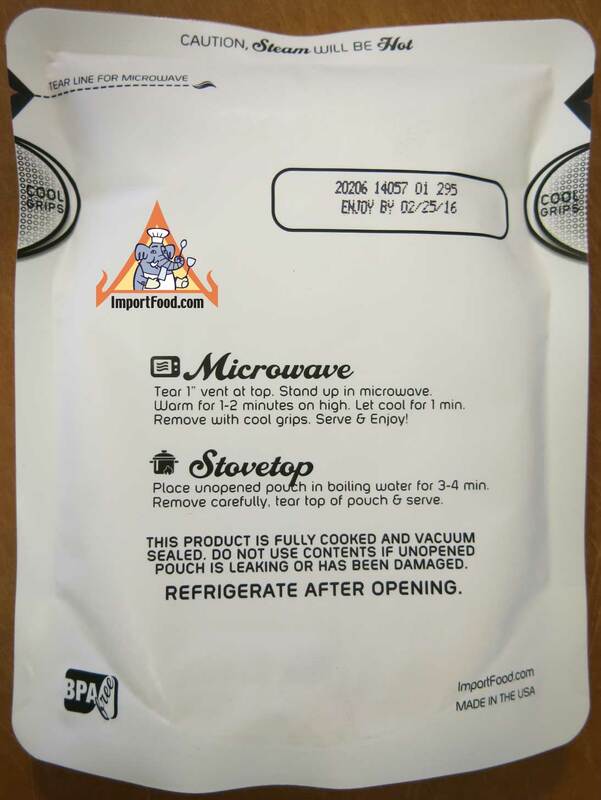 Store the pouch at room temperature, no refrigeration required. The Wild-Caught, Alaska Smoked Salmon. Inside every pouch is a generous handful (2 oz net weight) of premium wild Alaskan smoked salmon. Our salmon is soaked in our own simple, natural brine formula then put into a modern smoker, burning real hardwood. After it comes out of the smoker, we hand-cut it into chunks perfect for the Tom Kha. The freshly-prepared salmon is then added to the pouch and sealed up. Sockeye salmon is a quality, lean, healthy fish that comes at a relatively high price, but we wouldn't have it any other way. The combination of flavors here is not just irresistible to your tastebuds; served over steamed rice, this soup is one heck of a meal, offering plenty of healthy calories to carry you through the day. MADE IN THE USA. There's no need to wonder where your food comes from with our soup. This product is produced under the watchful eye of American regulatory authorities who set strict guidelines on food manufacturing. Our soup has already gone through a rigorous analysis, the process has been approved, and everything has been registered with the US FDA. Rest assured that you're also supporting American jobs. This soup is packed in the great Pacific Northwest in a new facility that rose from nothing and is now creating jobs for hard-working people. We're doing our part to not just support the local manufacturing economy, but also American farmers & fishermen. As business grows, employment is expanding and some workers are getting plenty of overtime: wage income that spreads throughout the community. Furthermore, when it comes to sales, ImportFood.com is an experienced global trader, so your support of this product will help us to create export markets--thus expanding American production. Why Is The Price So Low? Compare the price of our pouches to the salty, msg-laden Tom Kha spice pastes from Thailand that require you to add your own coconut milk & other ingredients. Our product tastes far better and generally costs less. Also, the retail price of 9 oz all natural cocont milk is close to what we're charging for the entire pouch of finished soup. Assembling all of the ingredients in your own kitchen to make Tom Kha from scratch would likely cost more. The explanation is that we import the coconut milk directly, and we deal directly with growers, all of this keeps cost down. 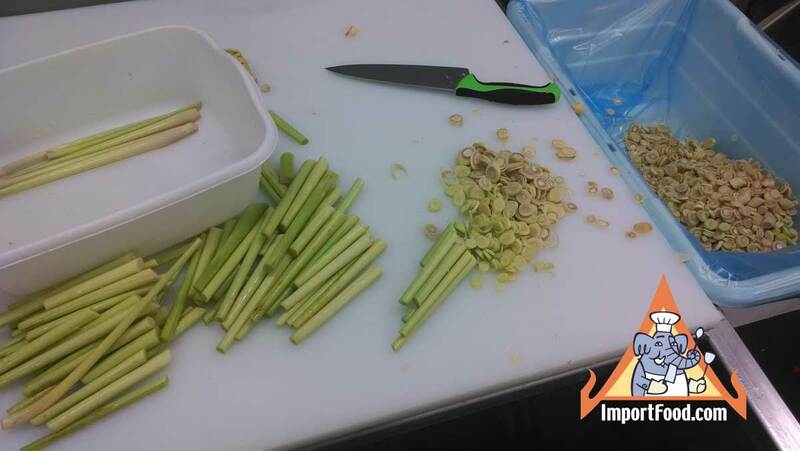 Also, we have our own retail store (ImportFood.com) AND we manufacture the soup ourselves, so we can sell it directly to you for near our production cost. You get a great deal, and we enjoy delivering a superior product.